"There is a place in God's heart that … only you can fill," writes Maxie Dunnam in this long-awaited sequel to The Workbook of Living Prayer. 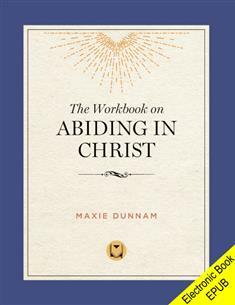 Eight weeks of daily readings in The Workbook on Abiding in Christ will help you find your place in God's heart and discover the secret to authentic Christian living. Through the brief teaching segments, scripture, ideas for reflecting and recording, suggestions for taking what you have learned from your prayer time into the day, and guides for group sharing, you will begin a lifetime of abiding in Christ. For individual or small-group study.